Alcohol Ink: Sun, lava covered mountains, and turquoise sea. Southworth Linen 100% cotton rag 32# paper hand-crafted to envelope form. (270) Produced, none released un-serviced. To quote the American author, Mark Twain, "Hawaii is the loveliest fleet of islands that lies anchored in any ocean..." Hawaii consists of eight major islands plus 124 minor islands, reefs and shoals, strung like a necklace across the Pacific for over 1,500 miles. The Hawaiian Islands have attracted human migrants in waves, first the Polynesians, then the whalers, the sandalwood merchants, the missionaries, the sugar planters and ranchers, the multi-ethnic traders and laborers, and finally the tourists. 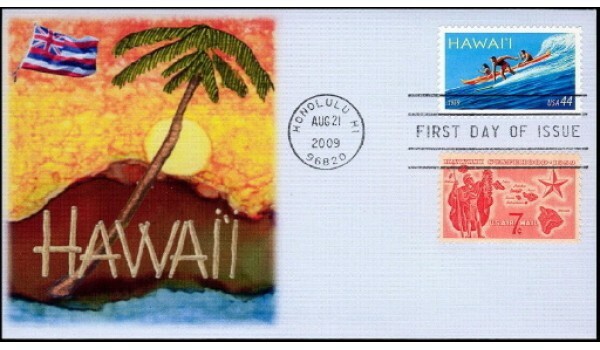 Hawaii was admitted to the Union on August 21, 1959, as the 50th state. The State flag has eight stripes (representing the eight major islands), of white, red and blue; the field closely resembles the Union Jack of Great Britain, from which the original flag apparently was designed. 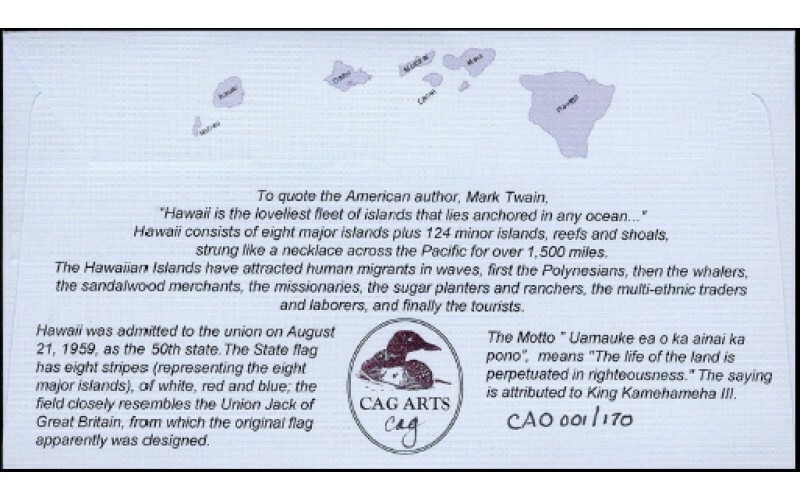 The Motto "Uamauke ea o ka ainai ka pono", means "The life of the land is perpetuated in righteousness." The saying is attributed to King Kamehameha III.